Above is a comparison of Thruway Exits 15 and 15A as they exist today (left) and the former Exit 15, before 1994 (right). The original Exit 15 was a standard "trumpet"-style interchange with the short stub of I-287 extant at that time. NY 17 joined with I-287 as shown, its divided roadway running along the outside of I-287 and merging with it at the New Jersey state line. Inside the spread median of NY 17, a pair of U-turn ramps completed the interchange. All connections between NY 17 and the Thruway were made at this interchange, for Exit 15A on the Thruway was not yet constructed (when it was, NY 17 and NY 59 were realigned). In the photo at left, a stub end of former NY 17 is visible. It is still possible to reach the old gore point of the NY 17 exit ramp to the New York State Thruway. 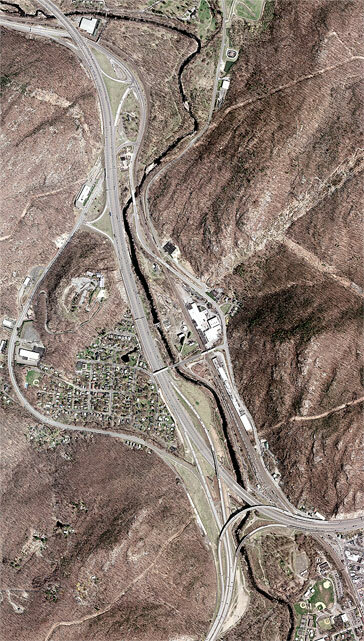 The map image used on this page is taken from the NYSDOT 1990 Ramsey and Sloatsburg quadrangles, downloaded from New York State GIS. These maps are in the public domain.